GALION — The “Help Wanted” sign is out in north central Ohio. It has been for years in and around Galion, an area that measures its success via the manufacturing industry. It was that way 100 years ago. It was that way 30 years ago. It remains so today. “Manufacturing is the foundation of this area,” said Gary Frankhouse Jr., Crawford County’s Economic Development coordinator. Unfortunately, many are unaware of the manufacturing business and employment opportunities available in and around Galion and no little about the skills needed to fill those vacant positions. Frankhouse leads the county’s WAGE program (Workforce Awareness for Graduates and Educators). Its goal is to connect local students and teachers to Crawford County’s manufacturing industry. To date, more than 400 students and 125 teachers have toured local business, where they have an opportunity to chat with businessowners talking about available careers and the the skills necessary to find success in the local manufacturing community. Local business owners lament their inability to find qualified, responsible workers to fill available jobs. Through the WAGE program, students learn become familiar with those opportunities, and how better to prepare for success in those jobs. Teachers and guidance counselors are learning how to better prepare students to fill those vacant jobs. Frankhouse has been involved in the retail business all his life. He said he is still learning about the area’s manufacturing industry. Opportunities are available in welding, CAD, CNC, administration and more. Training is available in most fields, but what many employers are finding is that it is difficult to find employees who are accountable, responsible and have the soft skills needed (such as common courtesy, good attendance, phone etiquette and more). Two students who have taken part of the WAGE program are Galion High School’s Caleb Strack and Crestline Middle School’s Logan Parella. Each was introduced at Thursday’ Galion-Crestline Area Chamber of Commerce 2016 Manufacturing Recognition Breakfast and shared what they learned through via the program. “It really opened my eyes as to the possibilities,” Parella said. About 100 business owners, politicos and guests attended the breakfast. All are well aware of those opportunities provided by the local manufacturing industry . In fact, they are responsible for about 1,500 employees in this area and annually contribute millions of dollars to the local economy. 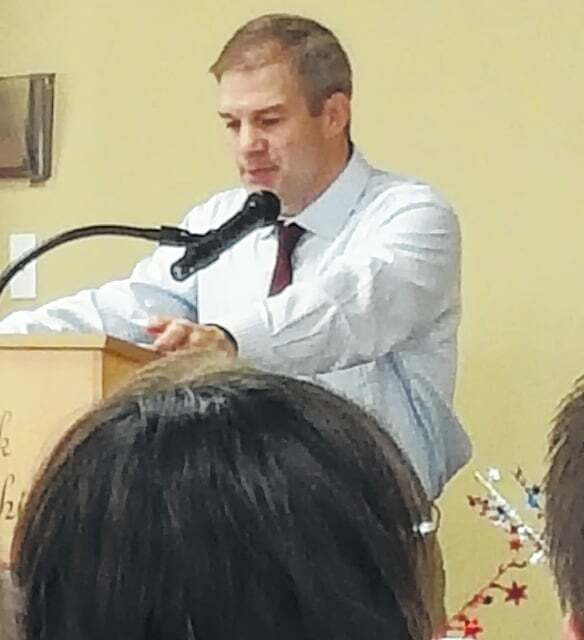 Jim Jordan represents Ohio’s 4th District in Congress. He talked of growing up and learning about work and jobs and responsibilities and budgets through his first job, cutting and maintaining lawns in Champaign County. But he knows that type of opportunity is not available to everyone, which is why program like WAGE are so valuable. “Students are being exposed to manufacturing opportunities. That’s a good thing. That’s a positive,” he said.